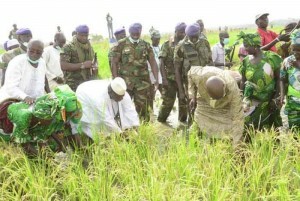 As part of the implementation of the country’s anti-hunger agenda, the Gambian leader, His Excellency Sheikh Professor Alhaji Dr. Yahya AJJ Jammeh has led dry season harvest exercise at one of the vast rice fields cultivated in the Central River Region (CRR) south. The harvesting exercise, marked the beginning of the dry season harvesting of the Vision 2016 rice fields in the provincial communities paving way for engaging farmers on dry season farming in the rural country. The field is one of the biggest among the many Vision 2016 rice fields, which are specifically cultivated in that part of the country as part of the broad implementation of the Vision 2016 food self-sufficiency agenda. They are the only rice fields being harvested in the dry season in the country as at now in the context of The Gambia’s food self-sufficiency drive. The first harvest of the Vision 2016 rice farms was in November 2014. Friday afternoon harvesting exercise was his (the president) first engagement in that southern part of CRR since arrival on Thursday evening in Janjangbureh, the administrative headquarters of region, as part of his assessment on the progress of dry season agricultural activities and the state of preparedness for the rainy season cultivation in the context of the country’s anti hunger crusade sanctioned in 2013. Meanwhile, thousands of people had lined up the road to give President Jammeh and his entourage befitting welcome as well as to show solidarity and love for the president. They are very appreciative of their leader’s agricultural initiatives, which have resulted to success stories today. Many of the farmers, who often render labour work on the fields, heaped praises on The Gambian leader for providing the necessary conditions, which has improved their livelihoods. Since its launching in 2013, the V-2016 has been drawing wider support within and outside The Gambia with the overall idea of ending decades-long importation of food, especially rice into the country. Pacharr rice fields, which is being harvested for the second time since the start of Vision 2016 campaign, has long been experimented to serve as Gambia’s main food basket and has this year been turned into massive production sites by the president of the Republic to serve the very purpose of their existence. The Pacharr field covers about 1,105 hectares and between 1966 and 1969, a Chinese (Taiwan) agricultural team introduced rice cultivation via the method of irrigation on Janjanbureh Island. This initial enthusiasm soon faded and the project ran out of steam. Another Chinese team followed this in 1974-1975 that set up base at the Sapu Rice Research Station. In 1973, The Gambia government started its development project. In 1982, a rice irrigation project was started at the Jahali and Pacharr Smallholder Rice Development Fields involving 1,474 hectares. About 30 years later on May 8th this month, 2015, the field (Pacharr) yielded its second harvest, part of which the field has been left uncultivated after many years. It proved a resounding success with yields expecting to surpass all expectations. From his second harvesting exercise on Friday, the president and his delegation on Saturday proceeded to potential fields and farmlands further into the Niamina where he inspected an ongoing laterite road construction which linked Jakoto and Kaur. The land area targeted for next season cultivation at Jakoto is measured at four thousand six hundred hectares (4600). Apart from the road construction, there are other series of ongoing land transformation works ongoing there. While inspecting the site, the president had made some observations on the nature of works being done on this road project and expressed his dissatisfaction for which the work is being carried out. The road as it is, very narrow, thus making it impossible for two motor vehicles to passed simultaneously. He thus urged the supervisor to expand the access road and build culverts and some subsidiary water passage to the rest of the field. From Jakoto, the president and delegation proceeded to Sambang-Mandinka also in the Niamina where he visited a vast land area suitable for large-scale rice cultivation. This land, according to the community, only a small portion is put under cultivation for many years due to access road and dwindling interest in rice cultivation by the community. On Sunday, the president and delegation visited Janjangbureh and Pacharr fields in the Lower Fulladu and Janjangbureh constituencies before presiding over to another well-attended meeting organised by the APRC party supporters, militants and well-wishers in Brikamaba in the Lower Fulladu District. Since it has been launched, the Vision has been praised as one of the greatest interventions of the Jammeh administration in addressing food security and household poverty. It has received a tap on the back by the International Fund for Agricultural Development (IFAD), following a visit to the country in 2014 by its president, Dr. Kanayo F. Nwanze. “The Vision 2016 is an ambitious one, but of course it can be achieved. We have the leadership behind it, who has a strong conviction and support for agriculture particularly the smallholder and rural women. But it also calls for strengthening of institutions, consistency in policies, an enabling environment for the private sector, and massive investment on rural infrastructure,” Dr. Kanayo F. Nwanze. was quoted as saying during his visit to the country in 2014 at the invitation of President Jammeh.